This post was originally published here on May 6, 2015. I’ve updated the photographs and text to celebrate Pi Day! Food “Holidays” are a dime a dozen these days. For example, did you know that March 4th was National Pound Cake Day. Or that March 7th was National Cereal Day? And are you planning to celebrate National Ravioli Day on March 20th? 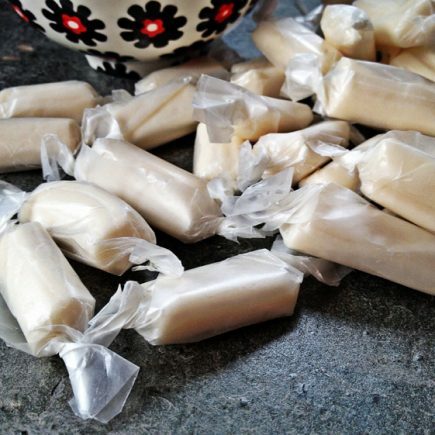 Or how about National Nougat Day on March 26th? If you’re thinking that some of these “Holidays” seem a bit contrived or ridiculous, then I’d have to agree with you there. In fact, most of these days just pass me by without notice or thought. Because honestly, who has time to keep up with them all. But there is one day in March that I always have on my radar. And that’s March 14th. Otherwise known as Pi Day. The annual observation of the mathematical constant π (pi), who’s first three digits are 3.14 (= March 14th). It’s basically the best day for someone like me, who’s one part nerd and one part dessert-a-holic. 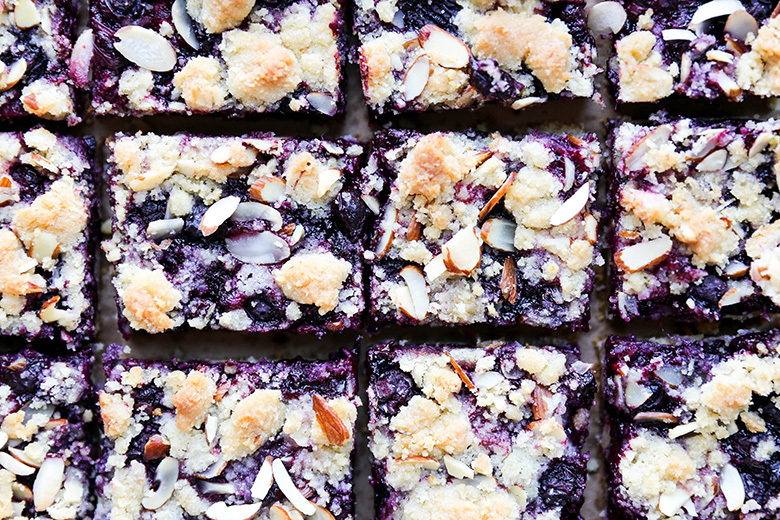 So, in honor of upcoming Pi Day, I decided to dust off the recipe for these Blueberry-Thyme Pie Bars with Almonds from the archives. They are the perfect way to celebrate Pi Day with all your friends and family because they are (1) delicious, (2) uncomplicated and very forgiving, and (3) made for feeding a crowd! Now, as you may or may not remember, traditional pie isn’t my favorite dessert. I’m considerably more of an ice cream, cookie and cake kind of gal. So instead of making a classic pie, I took a classic pie flavor (i.e. 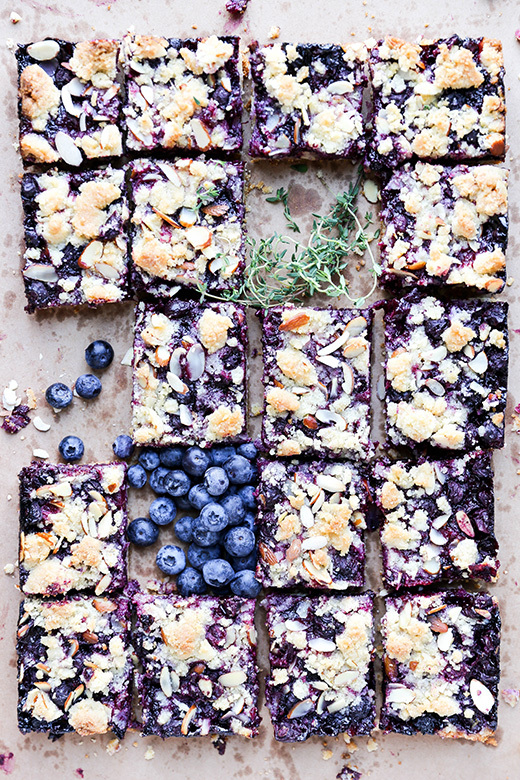 blueberry) and turned it into these pie bars. 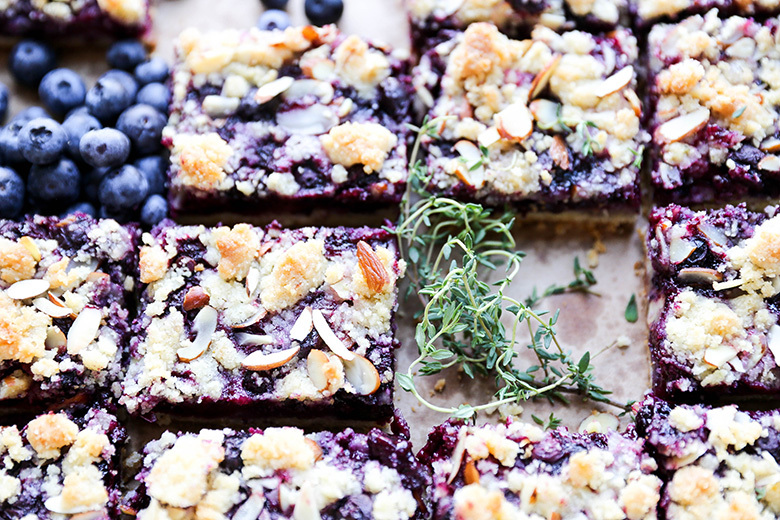 Which have all the delicious jammy goodness of blueberry pie filling (plus some extra oomph from the fresh thyme leaves), combined with an almond-flavored shortbread crust and a slightly crunchy crumble-like topping. It’s a dessert mash-up win, if there ever was one. You can even serve them warm (just re-heat the squares briefly in the microwave) with a scoop of vanilla ice cream for the full-on pie experience. I guarantee these will become a favorite in your house. They would be perfect for Mother’s Day, Easter, Memorial Day, 4th of July…you get the idea. How are you planning to celebrate Pi Day this year? What’s your favorite sweet pie? Or are you more of a savory pie (pizza pie, chicken pot pie, etc.) person? I want to know! Pre-heat your oven to 375 degrees. 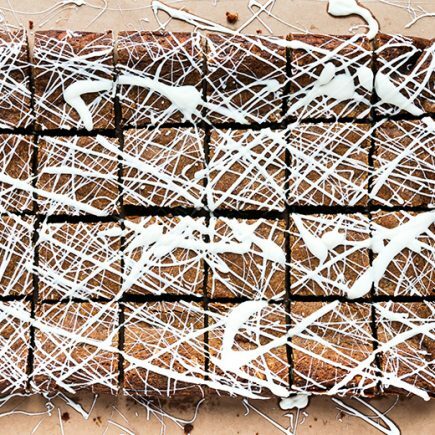 Coat a 9 X 13-inch baking pan with non-stick cooking spray and set it aside. In your food processor with the blade attachment, pulse together the flours, sugar, thyme leaves, baking powder, salt and lemon zest. Add the cubed butter, egg and extracts. Pulse until the dough resembles a course meal. Press about two-thirds of the dough firmly into the bottom of your prepared baking pan, using your hands or the back of a measuring cup to help create an even layer. Stir the sliced almonds into the remaining dough and set it aside, reserving it for the topping. 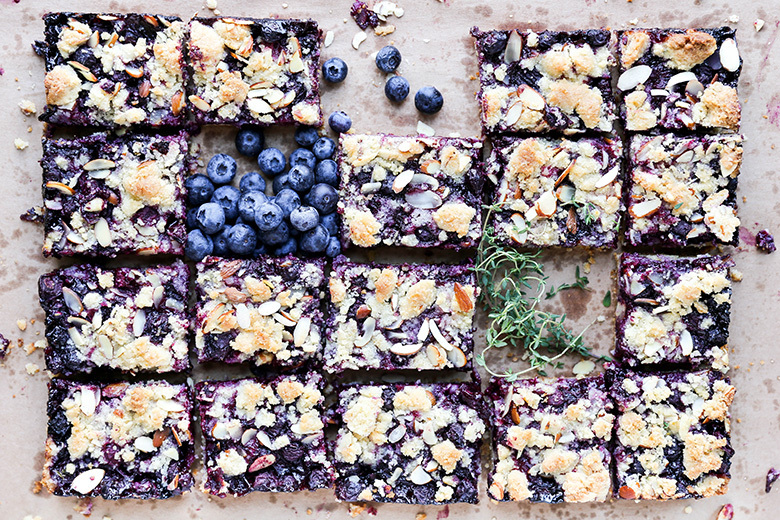 In a medium bowl, gently toss together all of the ingredients for the blueberry layer. Then spread this mixture evenly over the bottom crust layer. Sprinkle the reserved dough over top of the blueberry layer. Transfer the baking pan to your pre-heated oven and bake for 40-45 minutes, or until the top is lightly browned and the filling is bubbling. Remove from the oven and set aside to cool completely before attempting to slice into bars. These pie bars can be stored in an airtight container in your refrigerator for 2-3. If you don’t have almond flour, you can process almonds in your food processor until a fine meal is formed. You could also substitute the almond flour for all-purpose flour or whole wheat flour. Recipe adapted from my Blackberry Squares. Love, love, LOVE your new photography and styling Liz! And these pie bars? YES please! Warm with ice cream? 1,000 times YES! OMG! The thing is with bars, they’re so much easier than pie. It takes me a long time to make a pie simply because of the pastry and while I love making it, I have to carve out enough time (and with a stiff drink) so I don’t get stressed out! lol! Love your flavor combination too… SO good! Food holidays? I give them a pass. Pi day… (lol) when I was teaching this was a big day for our school. Students were over the top hormonal in their enthusiasm … it was all about PIE and not Pi hahahaaaa! Then I just wanted to eat all the pie. OMGeee! Thanks, Emily! Let me know if you try out the pie bars!